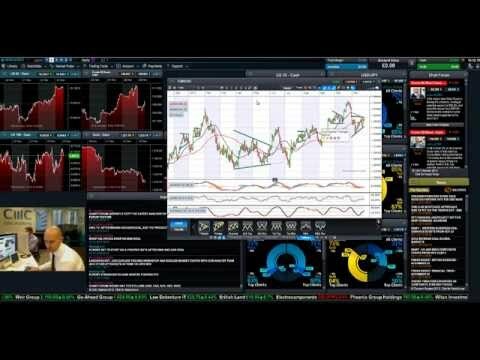 Learn how pattern recognition technology could help you with your trading. Our pattern recognition scanner automatically scans over 120 of our most popular CFD and spread betting products approximately every 15 minutes, including forex, indices, commodities and shares, for common chart formations such as triangles, wedges and channels. Hi there, and welcome to this short video having a look at the Pattern Recognition Scanner in a bit more detail. I've actually spoken to a number of clients recently who said that they find this tool quite interesting. But they want to get a bit of an idea from the Product Development department about how they can get the most from it, and maximise their time on it. So first of all, I've opened up the Pattern Recognition Scanner right here in the subscription area. I should point out that a few clients have actually thought that this means that there is a charge for pattern recognition. I just want to let you know that there's not. It's completely complementary to our clients. There's no cost at all. It just means that you're subscribing to different pattern types. Now one of the first things that you have to do is give your subscription title a name, let's call mine CMC 1. And there's actually nine different pattern types that you can go ahead and select. As you can see there, I've only selected the top three, so I've got wedge, channel, and triangle. You've got head and shoulders, double top, triple bottom, all the rest of them. Personally, I don't bother with these, because you already get quite a lot of patterns that come out at the end, and I find that the wedge, channel, and triangle tend to be the best. Then you've got product type. So you can choose all the asset classes that we've got. You can select all. To be honest, guys, I tend to prefer currencies, indices, and commodities. That's just what I prefer to look at. But if you're a share trader or you're into treasuries, feel free to select those, no problem at all. Then you've got your time interval. Time interval is basically your candlestick interval that the charts will look at. So you're looking at 15 minutes, one hour, four hours or one day. That's just the interval of your chart. So if you've got a triangle formation and it's 15 minutes, each bar that you see within the pattern will be a 15-minute interval, and the same for one hour, four hours, and then one day. Then you've got pattern type. In pattern type you've got emerging, which is like when you've got a triangle formation but the price action hasn't quite broken through it yet. So that's a trade setup that's not quite yet come to fruition. And then you've got completed patterns, where you've actually had a technical breakout. It's already broken through the potential support or the potential resistance. And then you click update and you're good to go. I'm just going to go to my emerging and completed section right here, and I'll have a look at some of these in more detail right now. So emerging patterns, as I mentioned, are technical trade setups that have yet to break out, so if we have a look at the Euro 50 cash and then click on chart, that's actually going to open up a chart with support and resistance levels already drawn on there. Let's have a little look at that in detail. So as you see there, it's a little triangle formation right there. If it breaks out through the potential resistance right here, or breaks down through the potential support, that would be a breakout and it would move from emerging and become a completed pattern. Why people like this section is it can be quite handy if you're wanting an early warning signal that a specific technical pattern is going to break out. In fact, if you click this button right here, that will set an alert so that when it does break through that potential support or resistance, you'll be alerted to it on your web-based trading platform. But as I said before, I personally prefer the completed pattern section because these are technical trade setups that I can be involved in right away. So if you have a look at silver for example, I'm going to go ahead and open up a chart right there, and then I'll run through what all the different columns mean on here. So, as you can see there, the difference in essence is that you've got your resistance, you've got your support, then you've got a price projection box. So let's have a look at silver in more detail. So when you see right here, you've got the product name here, you've got the time it came out, you've got whether it's bullish or bearish, and the interval. And, say this is a 15-minute chart, it's got 15 bars as its length. The star rating system matches up to MACD, the RSI, the Stochastic, the DMI negative and DMI plus, and the ADX. Basically, all the most popular technical indicators. Now if they all match up to the direction of the breakout, for example in this instance here, if they're all giving buy signals and you've got a bullish trend, then you'll get more stars. You can get one star, which means that they will either be neutral or pointing in the opposite direction. But to be honest, just because it's got more stars doesn't necessarily mean it's going to be a fair justification for future performance. It just gives you an idea that there's a little bit more evidence to suggest that a lot more technical factors are pointing in the same direction. So you might get a one- or two-star pattern, but it still will be worth having a look at, because this means that a lot of the other technical indicators might just be neutral. Then you've got the breakout price, you've got the real-time point change from the breakout. So where there's green, it's already gone in the right direction, and when it's red, it's actually going in the opposite direction. I tend to like this to be as close to zero as possible to show that there's still a little bit more mileage. And then you've got this button right here. This button is really important because it allows you to see a statistical analysis of up to the last 100 instances of this pattern. So, on here right now for silver, I could go ahead and attach an order ticket to there, so I'm just going to go ahead and do that right now. And this might be something that I might want to take advantage of, so I'm just going to go ahead and hit one, set my take profit to here, and my stop loss there. As a matter of fact, let's just change that to ten and hit return. So in this particular instance, I could be risking 26 to make 192, but I don't want to just do that. Obviously, you want to do your other analyses as well. I also want to see how successful this pattern has been in the past. So I'm just going to left-click on here and it's going to load up all the other instances that this pattern has been active. What you can actually see here is that in the last 100 instances that there's been silver, the triangle, and the 15-minute interval, 24% of the time it fails, 25% of the time it hits the low part of the price projection box, 13% medium, but 38% high. So technically I like to look for when there's a big ratio between failed and high. In this particular instance it's okay, but if that was about 15% and that was a little bit higher, that would be a stronger ratio to look at. But in this particular instance, if I had done my other research, and I had a good story and a trading plan... Because I would never trade purely on the back of pattern recognition. It just gives you a bit of an idea of what to expect. It can be quite useful for trying to do your risk/reward ratios as well. You can see there, we could be targeting the top end of the price projection box with my stop losses slightly below the breakout level in the census. Actually, now that I've moved that, that's £66 potential risk versus £190 potential gain, and then I'd just go ahead and click confirm and that trade would be placed and that would be it, done. It's also possible for you to go ahead and back test any of these products and pattern types. Just select the asset type you want here, for example I can just go ahead and select gold, and then it would go ahead and look at the exact same details for triangle, 15 minutes. I can change that to one day, for example, and it would look at the last instances like that. Very, very useful. But typically, I look at this. New trading opportunities come up every 15 minutes, but I can go ahead and change the interval here to say that I only want to see four-hour patterns, for example, and it would only go ahead and show me the four-hour patterns that are in play right now. I can go back to one day. It just gives you a bit of an idea of what to expect. We can have a look at the US Nasdaq right here. I can already see it's already gone quite, quite far into profit right now. Well actually, it's still got a good bit still to go right there, so it's eyeing up higher gains right there. I just leave that running in the background, and whenever new opportunities come in I check them out. If it fits into other parts of my analysis, it can be a very, very useful tool. It's something that many CMC (Markets) clients have already been utilising, about 12,000 of our clients have actually utilised the pattern recognition scanner so far. If you're a new user to pattern recognition, do get a chance to check it out, and just keep an eye on all the new alerts as they come in. Make sure you check the charts, and you'll see the price projections and everything else like that. Hopefully you'll find it a useful support tool to help you make more informed trading decisions. Well, I hope that kind of explains a little bit more about pattern recognition, and that you guys at home get the most from it. It's probably also worth pointing out, as well, that there's actually also manual pattern recognition available across all of our products. So if I have a look at, say, the dollar right here, I go to patterns. You can actually add these on manually. This doesn't alert you to the new price projection levels, but I can tell you that there's new opportunities right now. For example, it's hinting towards there being a trade opportunity coming now if this breaks out. So hopefully you guys will find that useful. Anyway, thank you very much for listening. Keep an eye on our YouTube channel for more helpful hints and tips.